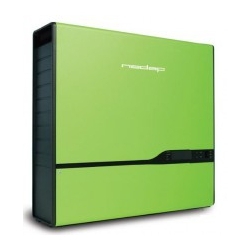 It is a compact solution for your photovoltaics – all in one. It is not necessary to have complicated wiring and switch boards, one inverter for photovoltaics and also for a regulation of charging batteries. The system works with any lead and Li-ion batteries. PowerRouter is all in one and furthermore it also has a stylish modular design which allows the system to expand in the future. The system can be monitored from anywhere on the globe through the application on your mobile phone or via the internet. Are you interested in PowerRouter? Do not hesitate to contact us by filling in our form. Alternatively you can visit our E-SHOP. 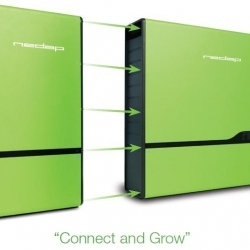 Pleare read below if you want more information about NEDAP PowerRouter. Why is PowerRouter so useful? While an ordinary PV power plant sends the production surpluses during a day to the grid without any further use, PowerRouter ensures that daylight surpluses are accumulated in batteries. In the evening you consume the energy from accumulators. It means that in the evening you do not have to buy an expensive energy while during a day you would send it to the grid. 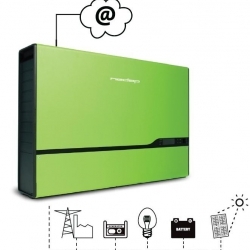 Photovoltaic inverter with the integrated intelligent battery management to optimize the energy consumption with PV wattage from 3.0 to 5.0kW. Photovoltaic inverter with the PV wattage from 3.0 to 5.0kW without any battery charging system which is possible to expand by a section of electricity accumulation and intelligent energy consumption management anytime in the future. It is ideal for everyone who thinks about the future and wants to expand the system by accumulation later. The extension unit for the PV inverter “PowerRouter Solar Inverter” to accumulate surpluses from PV production to the batteries. Thanks to this unit you can simply and without any complex installation expand your solar system for energy accumulation.